We've had the opportunity to visit Jamaica a couple of times during our travels, and we pack a lot of activities into each trip! 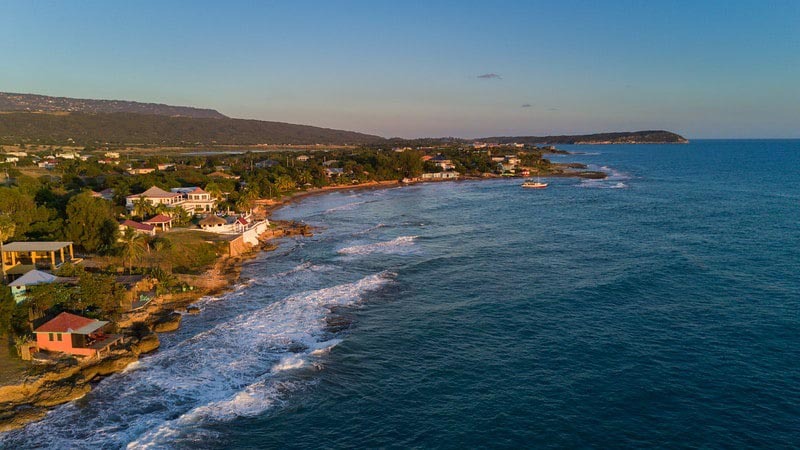 There are so many things to do in Jamaica, from Montego Bay to St. Elizabeth and everywhere in between. We've rounded up amazing excursion ideas to get you off the resort. 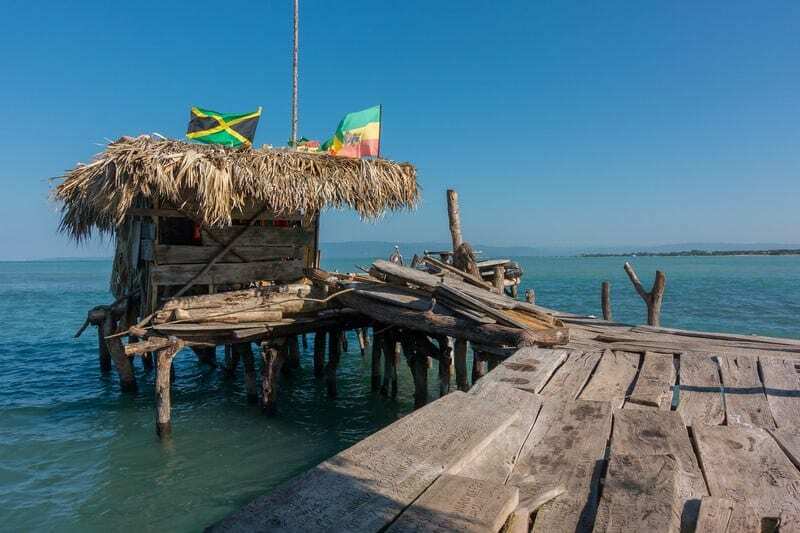 Enjoy, in no particular order, our favourite things to do in Jamaica, from Montego Bay to St. Elizabeth. Remember the jingle "Come back to Jamaica, what's old is what's new?" Well, Jamaica ain't stickin' to its old slogan. 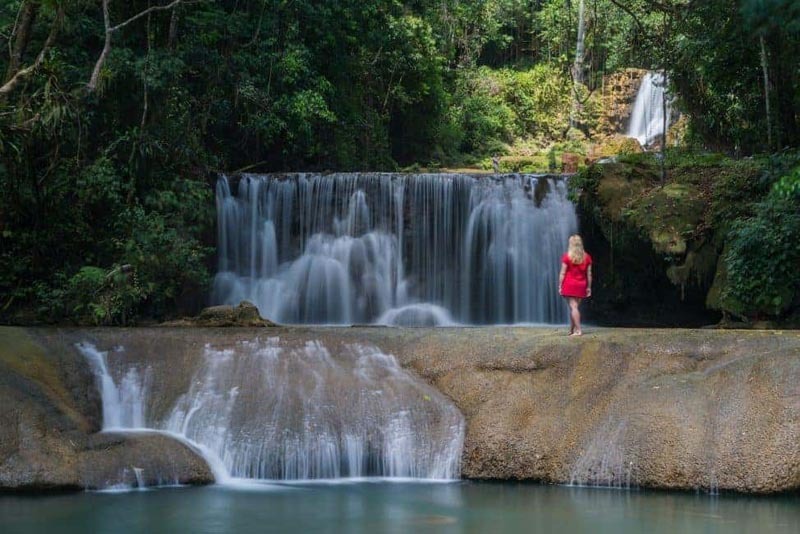 There are so many new things to do in Jamaica that if you haven't been in 10 years, you will see a huge change - especially in the off resort excursions. So, maybe it is time to come back to Jamaica, only this time get yourself off the beach and explore the island. When going to a tropical island, you have to visit waterfalls. There is nothing more fun than escaping the hot sun by swimming in lagoons. While Dunn's River Falls is a popular day trip, we enjoyed YS Waterfalls. This seven tiered waterfall is beautiful and fun! We met our guide at the entrance and he took us through the falls, showing us where we could safely swim, sit, and jump. We originally wanted to go independently, but I am so glad we had our guide with us. He took photographs of us, walked us through the falls, brought us into places the independent travellers couldn't go, and he set up the rope swings for us. I have never had so much fun at a waterfall. The pathways are easy to walk and the water is refreshing. 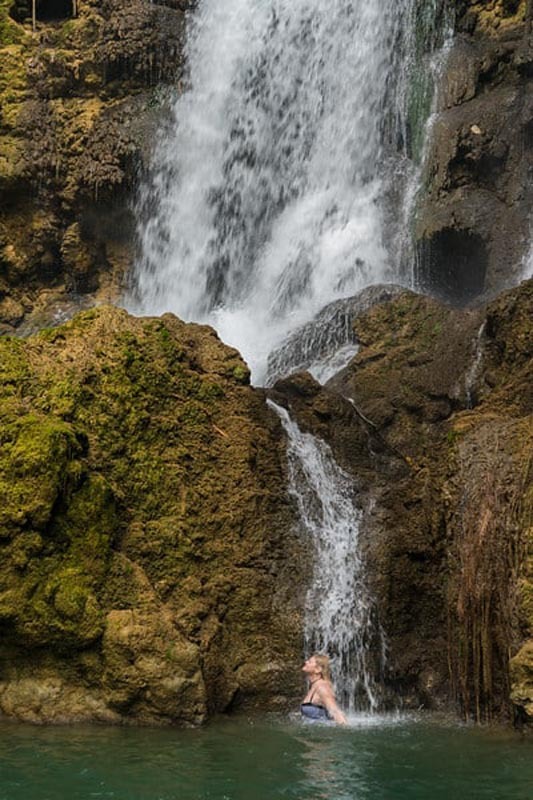 You can be as adventurous or as relaxed as you want at YS waterfall. If you are into doing the rope swings, go for it - it's a blast! Bring water shoes for walking. The bottom is rocky and slippery and having shoes makes life a lot easier. But you can also bring your photography gear, including a DSLR and tripod. Your guide will stand by your gear and it will stay dry on the path. For more information visit YS Waterfalls. 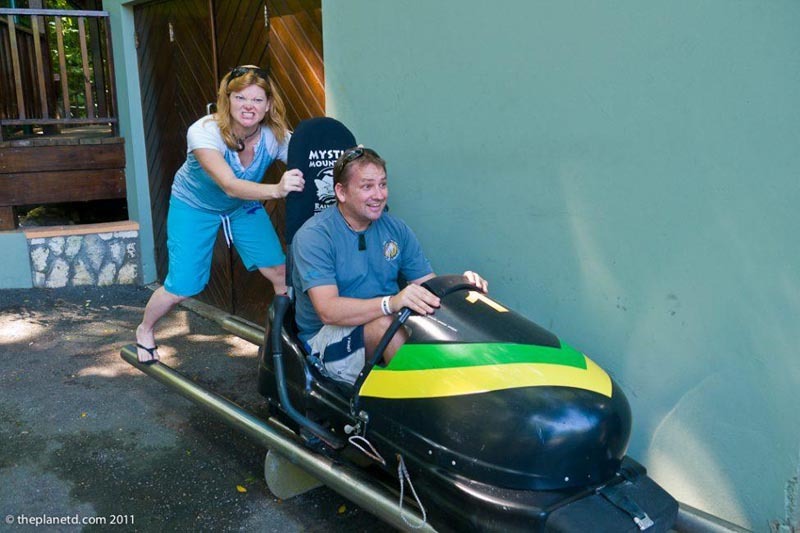 If there is one thing you have to do when you go to Jamaica, it's hit the bobsled track. You can spend a day at Rainforest Adventures. After you ride the scenic chairlift up to the top of the mountain, there are a flurry of activities to do. These include the history museum, pool bar and café, waterslides and zip line, and of course the star attraction, The Bobsled. Whiz down the hill as fast or as slow as you want, you have control of the brakes - but let me tell you now, fast is fun! A fifteen minute chair ride takes you up to the top of the mountain where you can have a look around before you hop on the bobsled. The ride is fast and over before you know it, but it's exciting and you feel giddy racing through the rainforest. Take the whole day off to sign up for the full package, and experience every adventure Rainforest Adventures has to offer. BOOK YOUR BOBSLED ADVENTURE NOW! No Caribbean Adventure could be complete without a zip line excursion. Our guides were absolutely fantastic, and although this particular zip line was one of the more mellow canopy tours we've been on, it was beautiful and a lot of fun. We recommend it for first-time zip liners. It has enough speed to make your heart race and the platforms are high enough to make you realize that yep, you're way above the ground. As it is located on an old plantation, it is very picturesque. The jungle is dense and scenic, but the highlight is zipping right through an opening where the branches split in a large old growth tree. 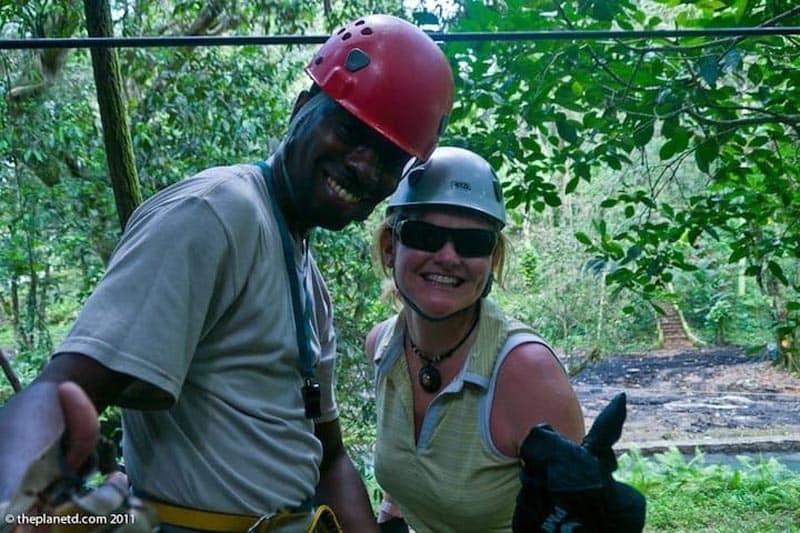 Book Your Zipline Adventure with Transfers Here! If you’re looking to revitalise, the Riu Hotel Montego Bay offers the best facilities: a freshwater swimming pool, Jacuzzi, sauna, gym and wellness centre . 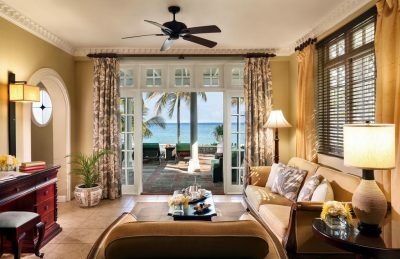 This 400-acre resort has 2 miles of private white sand beach on the Caribbean Sea. It features 50 pools, 3 restaurants and 5 bars. Truly incredible. Chukka Caribbean is everywhere on this island and we visited yet another location of this Jamaican staple. We were running a little late due to our catamaran tour going long, so we missed the dune buggy adventure that we had booked, but Chukka was kind enough to move us to an ATV tour. SOUND LIKE FUN? 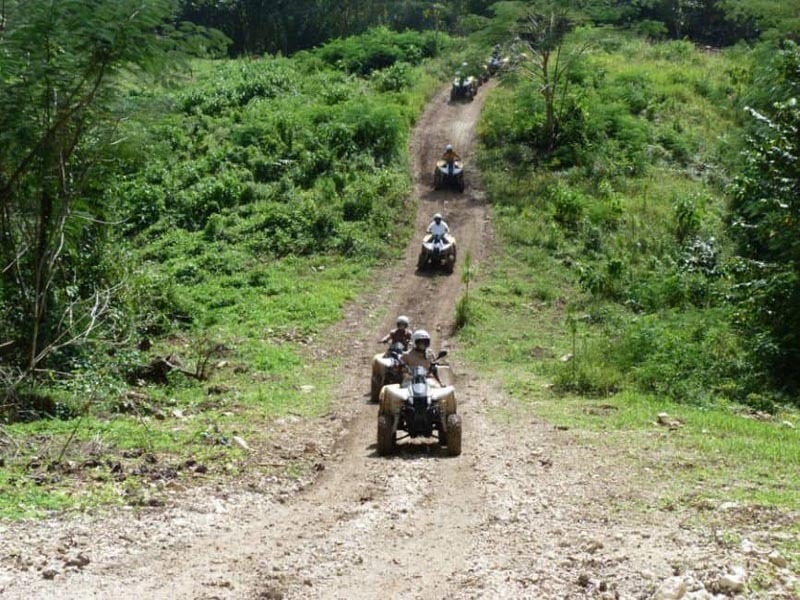 BOOK YOUR ATV TOUR NOW! I actually enjoyed this ATV experience better than the trip we took in Alaska. We were hesitant on taking part as we often find ATV trips to be a little light on adventure due to the liability risks for the company. They usually never allow you to let loose, but these guys were great. They kept a steady even pace that gave me enough of a thrill to be content with the speed. It was also cool to climb the steep mountain and take a look over the island once we reached the top. We've done a couple of hiking and biking excursions in our day and Damian's on the South Shore was one of the best we've done in the Caribbean. Why? Because he takes you into the real Jamaica. 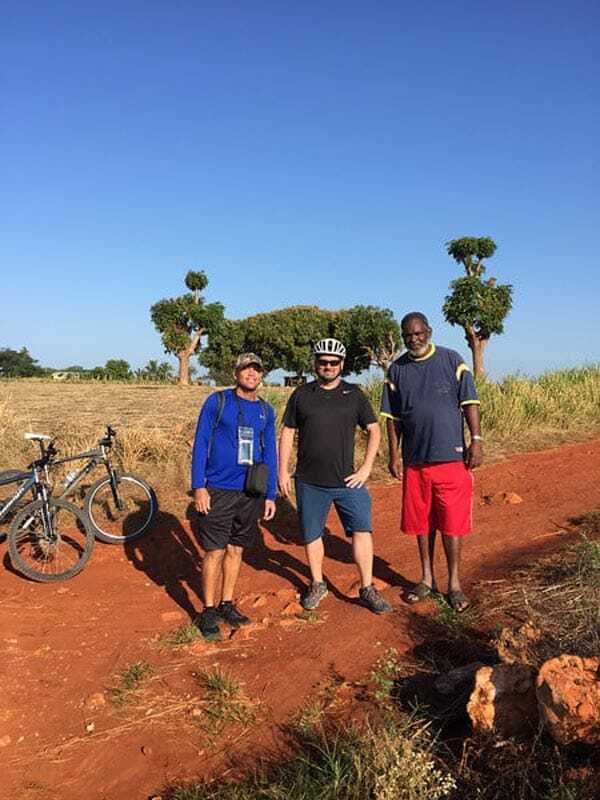 During our cycling trip we stopped to chat with local farmers, we cycled through fields, and we even met with a local historian to learn about the history of St. Elizabeth. Did you know it was settled by the Scottish? For our hiking trip with Damian we climbed to the top of Chateux Garden, where we had extraordinary views of the South Coast. What we loved was walking through local villages and farms. People still live the traditional way on the side of this mountain, moving their livestock and watering their crops all by hand. It's hard work and it's a privilege to walk through their communities. This is difficult to find and you should have a guide out of respect for the villagers. Damian knows everyone in the community and they welcome him and his tours to their land. For more information you can email Damien at [email protected] for details or book at Jakes Resort. 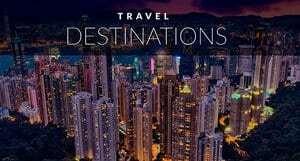 – St. Elizabeth is a 2-hour drive from Montego Bay. It’s worth the drive. – Many excursions can be booked through Jakes Resort - visit their website for details. 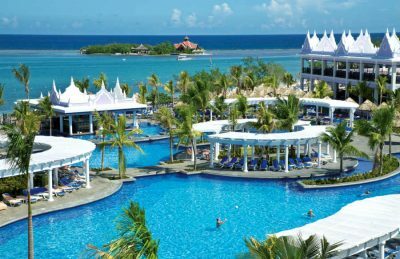 – Jakes Resort and Riu Palace are both excellent but very different experiences for a honeymoon in Jamaica. Here is the link to Riu Palace Resort. – For more information on Jamaica, visit the Jamaican Tourism website and follow them on social. Have you eaten too much on the resort? Get yourself out for an informative hike followed by an all downhill bike to the Caribbean Sea. We stopped to learn about the flora and fauna and tried a taste of the termites in the large mound. That wasn't exactly part of the tour, but one of our fellow hikers, Steve, told us all that they taste delicious. Never one to back down from a challenge, I thought I'd give them a try. Our guide gave the mound a good shake to wake up the termites and out they came. They weren't too bad! We hiked up further, enjoying the conversation, and were greeted at the top by not only a great view, but also cold towels to clean ourselves off. After a quick relaxation period, we strolled back down to grab our mountain bikes and ride through the fields to the beach, where we enjoyed fresh coconuts and a dip in the water - if we so desired - while listening to that wonderful island music! For more information visit Bracco Stables. It's one of the most romantic excursions in Jamaica. Bamboo Rafting down the Martha Brae River is a relaxing way to spend 90 minutes enjoying the scenery while learning about the local history and culture of the area. You can stop at bars for a drink, purchase crafts and paintings from local artisans, or play on the rope swings along the way. The unique Pelican Bar is an excellent excursion to get you off the resort. Head off with a local fisherman to a place one mile offshore, in the middle of the Caribbean Sea. It's a place to party, relax in the shallow waters, and enjoy a cold beer at sunset. 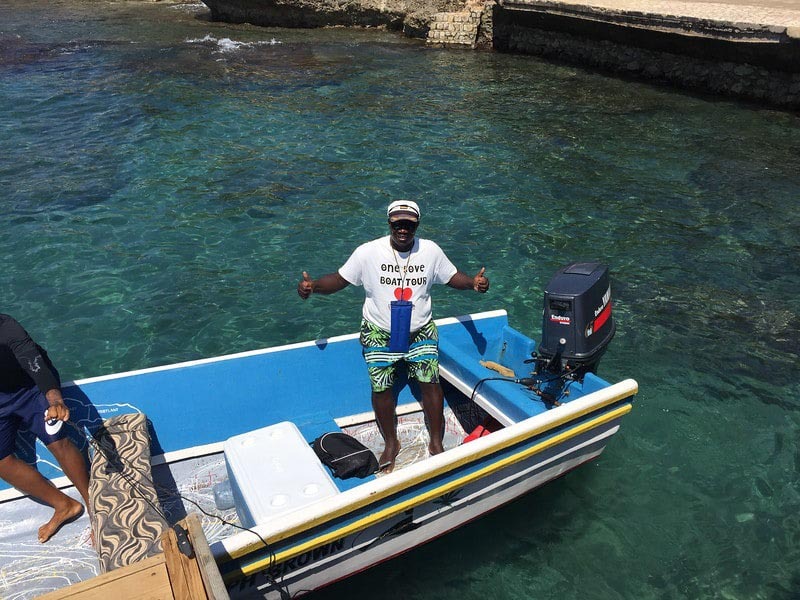 Tours leave from Ochos Rio, Negril, and Montego Bay for half day trips, or you can stay on the South Coast at Jakes and be out at the Pelican Bar in 20 minutes! The only way to get there is by boat, and it is the perfect spot to watch sunset while enjoying a cocktail. We love a good safari. I think it is a privilege to see wildlife in their natural habitat. While once endangered, crocodiles are now protected and you can see them on the Black River Safari. 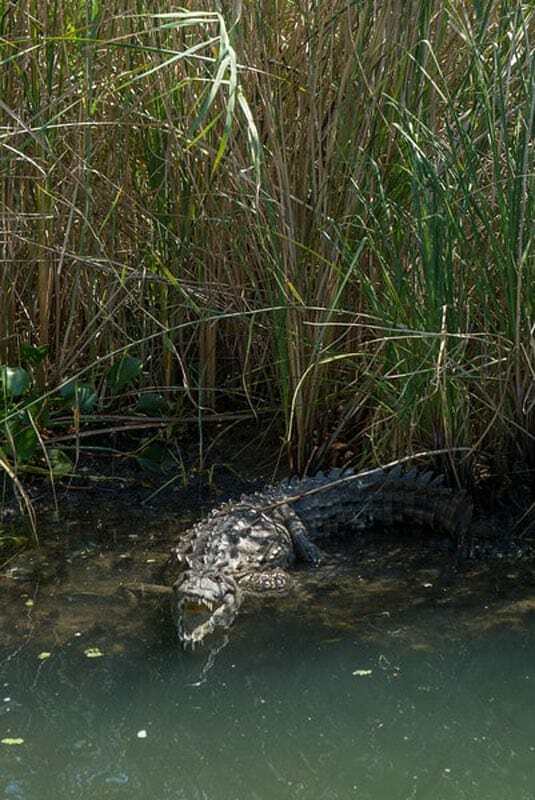 This 90-minute tour lets you get up close and personal with crocodiles as they laze on the banks of the Black River, swim up to the boats, or hide in the mangrove trees. It's a Jamaican excursion you won't forget. Combine the YS Waterfalls with the Black River Safari and a Rum Tour! 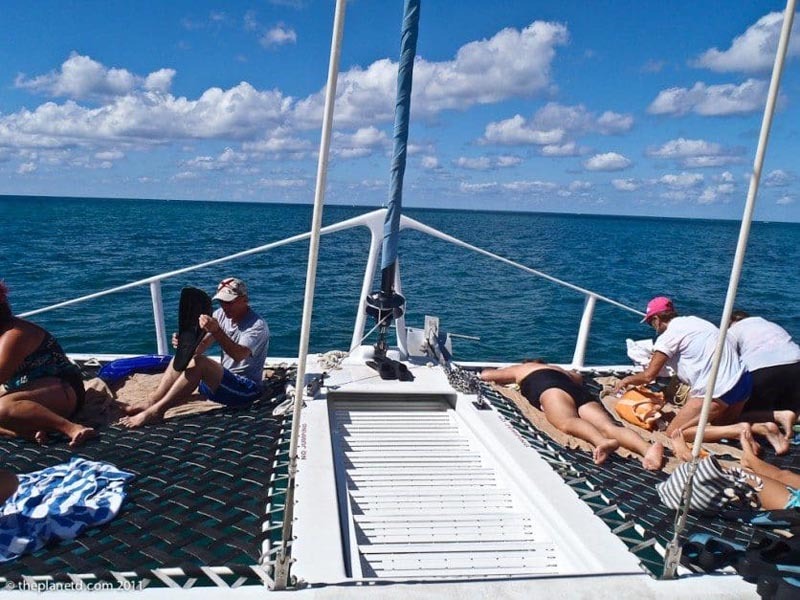 I have always wanted to go on one of these picture-perfect catamaran tours in the Caribbean. 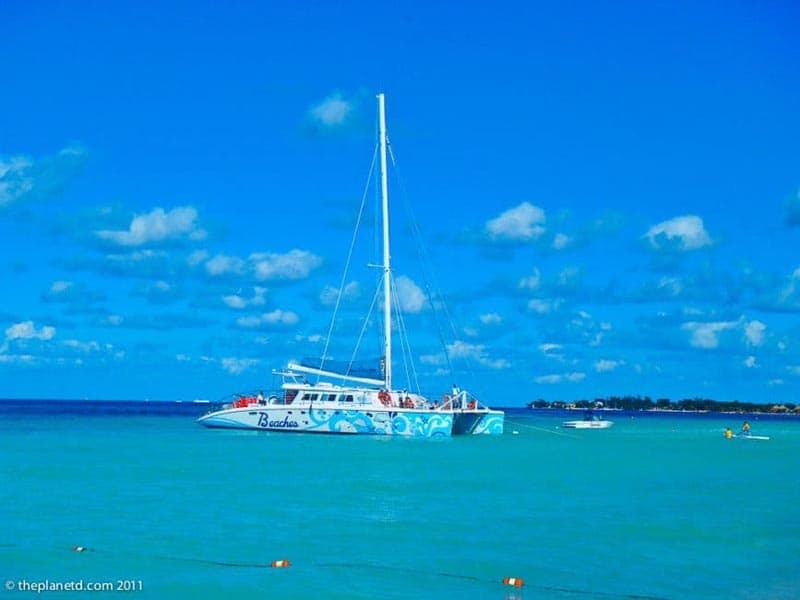 Catamarans are the boats that you always see in the commercials promoting the Caribbean Islands. I'd never taken one of these famous island excursions until this trip, and it didn't disappoint. As soon as we were on board the staff took great care in making sure we had a super time. We sat at the front working on our tans until we reached our snorkeling destination. The music was blasting and the snacks were laid out, but there is no drinking until after snorkeling. 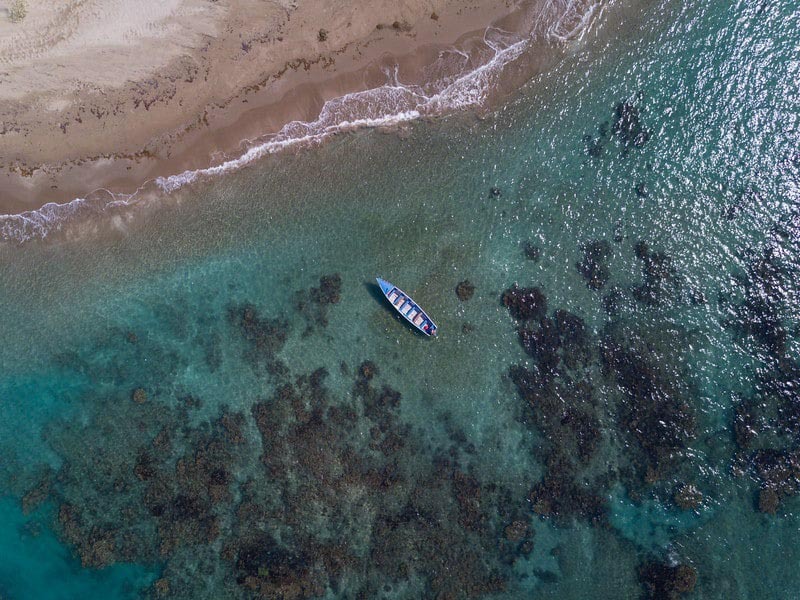 Once we reached our destination, we followed our guide into the warm water and spotted trumpetfish, puffer fish, and starfish. The water is calm, inviting, and warm. 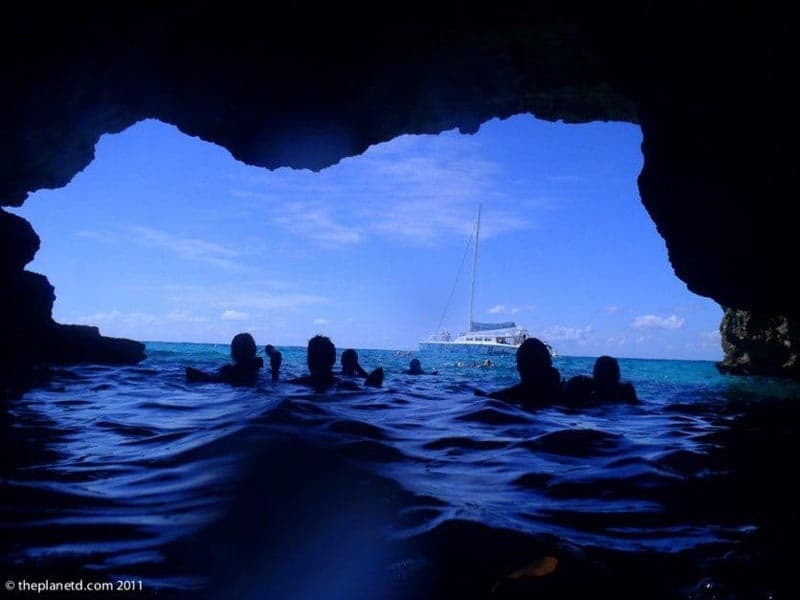 Don't worry if you've never snorkeled before, this is a trip for beginners. They even make everyone wear life jackets so you are completely safe. A highlight for me was hanging out in Pirate's Cave, a sea cave where pirates used to hide their stashes of buried treasure. We swam around for a bit and then hopped back on the boat for our journey home. Once back on, the bar is open and the music blasts, so we sipped rum punches all the way back to the beach! It's a Jamaican institution. Most people don't get off the resort to enjoy the truly delicious food available in Jamaica, but when they do, they often go to Scotchies. 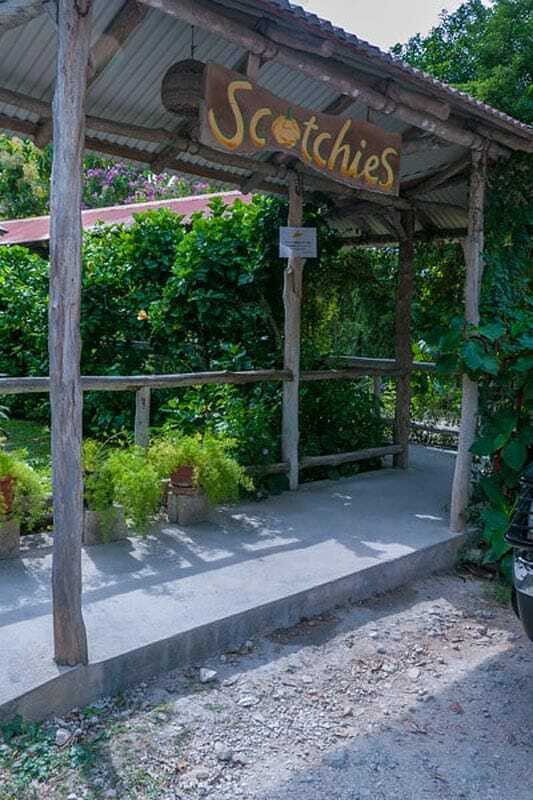 Scotchies serves Jerk the way they do around the island. It's family style, wrapped in tin foil and drenched in delicious jerk sauce. If you are going to try one dish in Jamaica, make it jerk chicken! Take it one step further and try your hand at cooking Jerk. 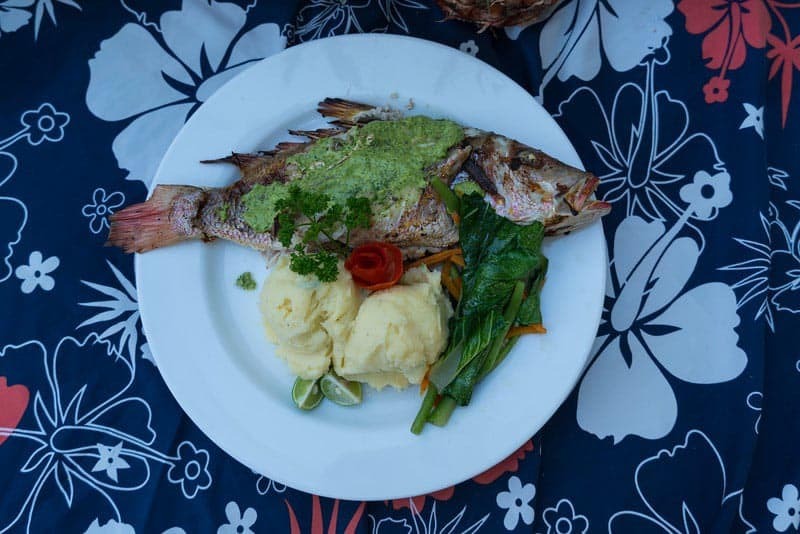 At Jakes' Treasure Beach, we made Jerk Snapper and it was delicious. We learned all the ingredients that went into jerk sauce, so we can now make it at home! But we're not going to give away the secret, that's something you'll have to learn when you try a cooking class in Jamaica yourself. 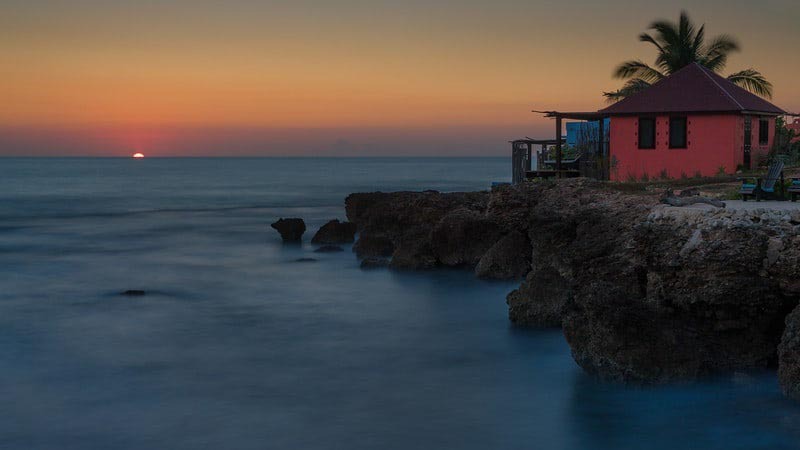 Once you are finished cooking, you get to eat your feast and with the view at Jakes Resort, you'll want to spend all night relaxing as you watch the sun go down. Once the sun's down, the band plays and the party begins. What I love about staying at Jakes is that locals hang out here and the tourists have a laid-back feeling that is far away from the all-inclusive chaos of the more popular destinations. 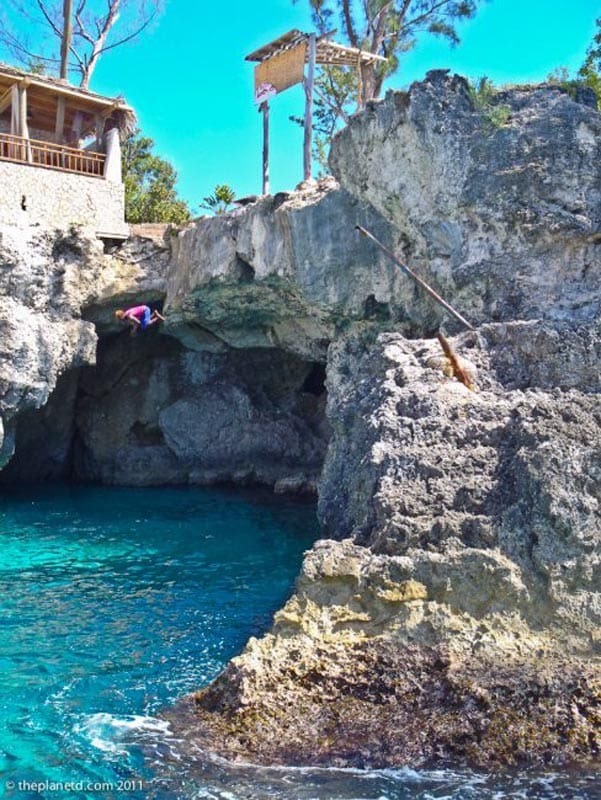 Rick's Café is famous for the cliff divers that put on a nightly show. It doesn’t look so high from the photos, but it is a fair distance and they even have higher platforms for the pros to jump off of. We figure it must be dangerous since someone in our group told us that a friend of hers broke her back jumping from this very spot in the past. So, we suggest watching the experts at work rather than jumping yourself. But if you are confident and have the skills, go for it. 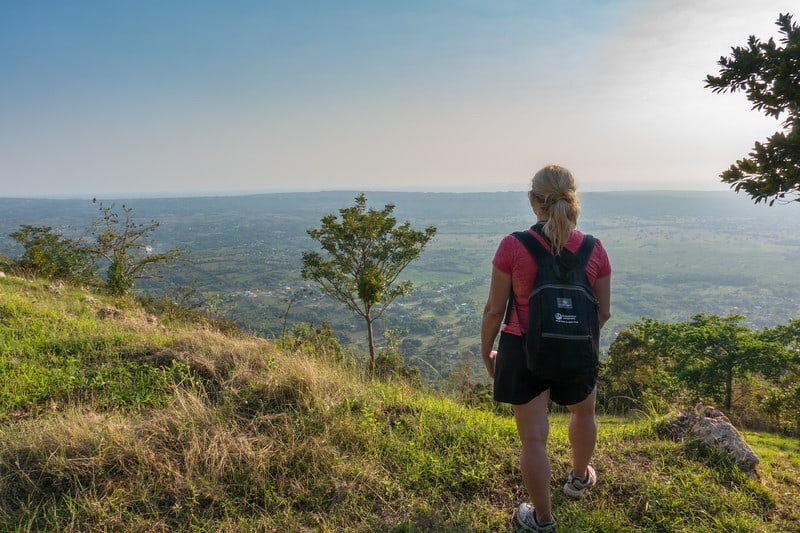 However, if you are looking for adventurous things to do in Jamaica, we've got more on our list below! 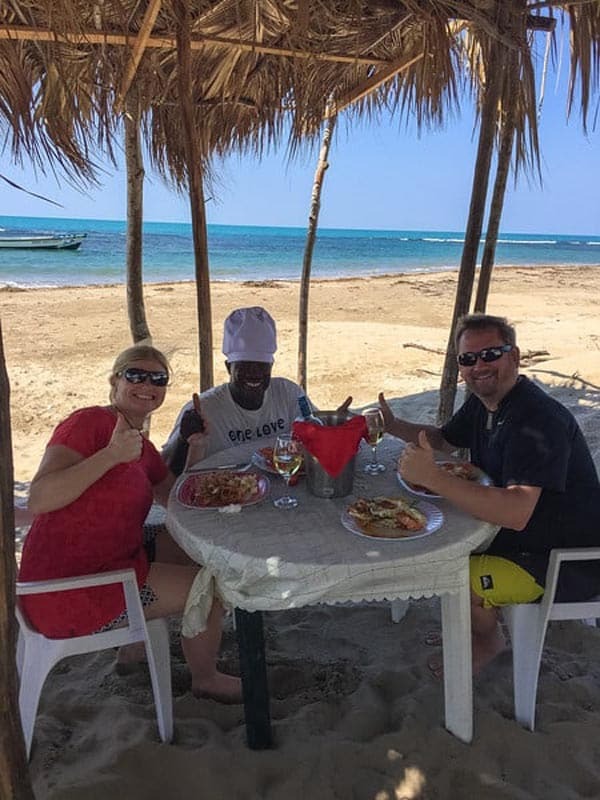 It was the highlight of our trip to join Captain Joseph on his fishing boat with his two sons in dolphin watching and dining on their private beach. He is a skilled captain with 25 years of experience. The rugged South Coast is beautiful to explore, and then to have a romantic dinner on a private beach is pure heaven. 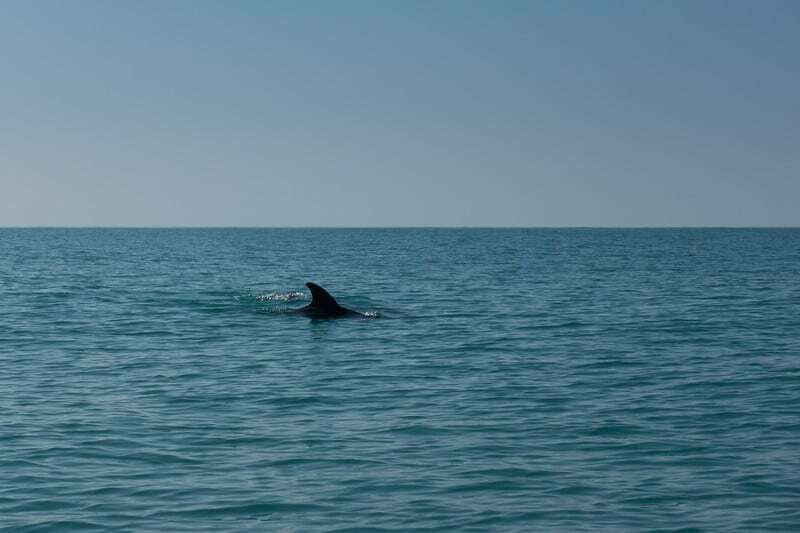 We had a blast dolphin watching with captain Joseph. We sat at Dolphin Point watching dolphins swim by, we walked on the long sandy beach, and we sipped rum punch and Red Stripe beer as Captain Joseph became Chef Joseph and prepared a lobster feast -complete with chilled wine and all the fixings - on his outdoor stove, using driftwood to cook. There is so much to do off the resort in Jamaica. Try horseback riding through the sea, hop on a dune buggy, or try one of at least 3 other zip lining adventures. There's snorkeling and diving, parasailing and kite surfing. While it is great to relax on the beach with a Mojito in hand, it's exciting to get yourself off the resort and enjoy everything that Jamaica has to offer. Jamaica's rugged South Coast is breathtaking. 25 Responses to "Things to Do in Jamaica – 14 Fun and Unique Ideas"
I Love Jamaica. Because there are lot’s of places for enjoyment along with families and buddies. Hi, I’ve been traveling vicariously through your beautiful blog! It’s always fun to see my home country mentioned in blogs. 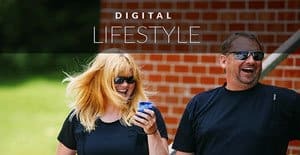 It would be great to feature Kingston in one of your posts. I wish more tourists would visit. With the new highway, it is only 50 minutes from Ocho Rios. Another part of the island you didn’t mention was Port Antonio. It’s the most beautiful part of Jamaica. If you ever visit Kingston or Port Antonio please feel free to email me. I would be happy to give you a list of places to visit. Some great adventures, Although the Caribbean island of Jamaica is best known for its calm seas, laid back atmosphere, white sand beaches and all inclusive jamaica resorts, the island of Jamaica is becoming known as one of the premier surfing location in the world. So Surfing is a must. I didn’t do any shopping there, but I am sure that by the cruise terminal there is a lot of shopping in Jamaica. And I didn’t visit any plantations either, but we did visit a lot of local farmers which is way more interesting since they are locally run. 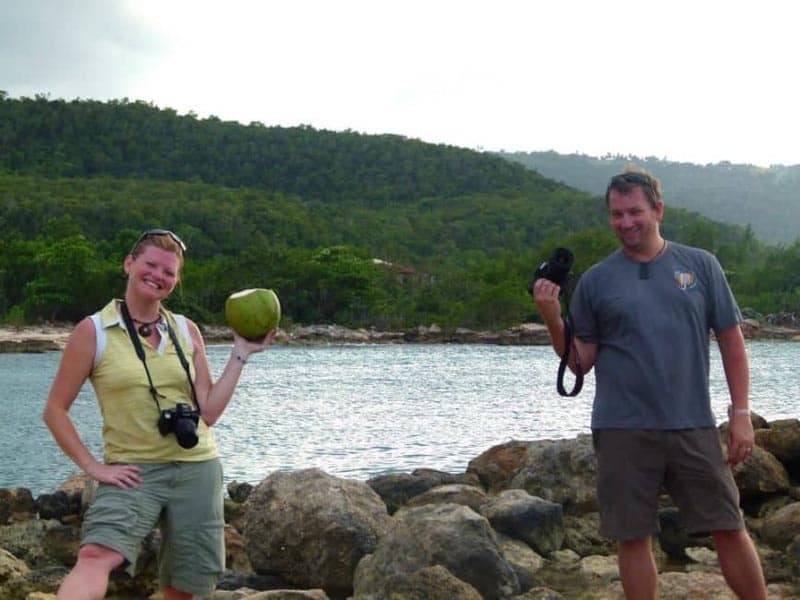 Great overview of what Jamaica has to offer Dave & Deb! As an Airline Pilot I fly into Jamaica frequently. You should definitely add river rafting on the Rio Grande to your list! Rafting on the Rio Grande was an activity first introduced by legendary Hollywood star Errol Flynn in the 1940’s. Also, Port Royal was the Pirate Capital of the World (think Pirates of the Caribbean!). Port Royal is close to Kingston Airport on the South Coast. Here is also one of my favourite beaches in Jamaica; Lime Cay – which is a beautiful deserted tropical island surrounded by turquoise blue water and a short speed boat ride away from Port Royal. Not a huge adventure, but one of the coolest things to do in Jamaica is to go swimming in the Glistening Waters where you swim at night and when you move in the water the microplanktons glow and light up your whole body. It’s truly magical! Typically when we go to Jamaica, it’s hard to get us to leave the beach. We have done a waterfall hike and that was a lot of fun. We also rented a moped once and drove around the cliffs area in Negril and we had a blast. I would love to try bobsledding! I wish i could make my Jamaica trip amazing. 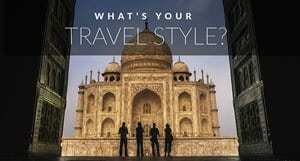 Thanks for sharing, really it will help my next trip with my clients. I went Dunns River Falls in Sept 2014. My friend is Jamaican & we weren’t part of a tourist group. We were confronted by many guides for the Falls but we kindly refused their assistance because the guides start the journey half way up the Falls & takes away from the true experience of actually conquering ALL of the journey of reaching the top on your own. We had incredible photos & videos made by my water proof cell phone. I just wanted people to know you do have options. I loved being there & cannot wait to go back in the future. Thanks for the information Brenda. You are right, there are definitely options and often the best experiences happen without a guide. We originally weren’t going to use a guide ourselves as we are fans of going it alone too. We ended up having one and had a great experience, but I am sure either way is awesome. I’m glad you loved it! Wow! 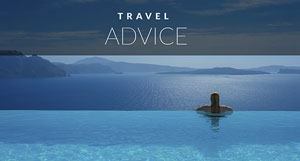 great list given ideas about Things to do makes Jamaica trip an amazing thanks for the info. Bobsledding and dogsledding aren’t exactly what you expect on a tropical island! Sounds like there are some fun and unusual activities on offer. Did you guys go in August with Tourism Jamaica? I was supposed to go on a bloggers’ trip but had to decline due to pregnancy #3!!! Can’t be pregnant and bobsledding and ziplining, can I? Or can I??? LOL! Hi Jen, we were supposed to go on that one too, but we actually ended up going in November. I think that this latest one suited our blog better anyway since it was all about adventure. The August one I do believe was very different. Congratulations on your pregnancy!